In particular, in the last few days, the patriarchal "Secretary of State" , metropolitan Ilarion of Volokolamsk, president of the Russian Foreign Affairs Council has made some statements to TASS newsagency. On 29 April he had issued a statement that the decision of the Russian Supreme Court, which defined Jehovah's Witnesses as an "extremist association", was taken without any consultation with the Orthodox Church. "I would like to emphasize that the Church has taken no part in this matter," the Metropolitan said. "The Church does not appeal for heretics, members of sects or dissenters to be prosecuted. However, the decision to ban Jehovah's Witnesses is to be considered a positive act in the fight against the spread of sectarian ideas, which have nothing in common with Christianity," according to Ilarion. "There is no doubt that sectarians will remain and continue their activities, but at least they will stop being openly on the same floor with Christian confessions, and that is a good thing." The Patriarchal Representative concluded that "the activity of Jehovah's Witnesses violates the norms of the Civil Code". On May 2, the metropolis intervened in a TV program "Russia 24", further stating: "This is a totalitarian and dangerous sect. I am deeply convinced, having had more than once the opportunity to speak with members out of the sect. The members of this association are dangerous because they approach people on the street and offer their literature, presenting themselves as a Christian group. In fact, their activities are based on the manipulation of consciences. They erode the psyche of people and families. " Moreover, according to Ilarion, "they deform Christ's teaching and falsely interpret the Gospel. Their doctrine contains many lies: they do not believe in Jesus Christ as God and Savior, they do not recognize the doctrine of the Holy Trinity, and therefore cannot be called Christians." 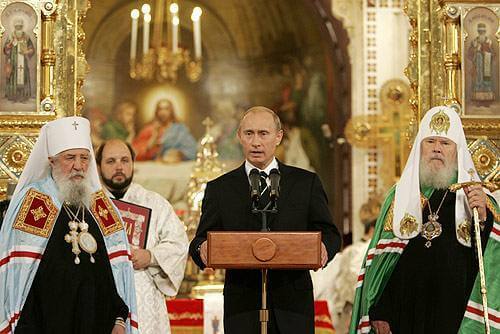 Meanwhile, the secretary-general of the Russian Catholic Bishops' Conference, Msgr. Igor Kovalevsky, issued a statement to a Catholic magazine on May 2 that "the situation in Russia today is complex and difficult. Catholics have serious concerns about having to face, if not persecution, at least the new forms of discrimination and the limitation of our freedom to profess our faith. " According to Kovalevsky, "the law must be applied to everyone with justice ... laws can be severe, but remain inviolable. I think the government should give everyone a clear explanation of the reasons that led to the liquidation of this organization. " The Catholic prelate concluded by stating that "Jehovah's Witnesses have the same right to defend their dignity in the faith as all other citizens. Although the defense of human rights is not our main task, the Catholic Church supports everybody's right to freedom of conscience. " Meanwhile, Russia is waiting for the remains of St. Nicholas of Bari to arrive in Moscow. They will be in Moscow from May 21 until July, when they will be exposed to the devotion of the faithful in St. Petersburg until July 28. Millions of pilgrims are waiting to visit the patron saint of Russia and this marks the first time they have been exhibited in the country since 1073, when the remains of the bishop of Mira were transported to Bari. According to the protopriest Maksim Kozlov, one of the most prominent representatives of Patriarchate of Moscow, this event indicates that "the Russian Orthodox Church and the Roman Catholic Church have finally found the right direction in their relations, the shared foundations of the ancient Church of the first millennium. "